I am using air quotes (and real quotes as I write) to describe this as a painting for couple of reasons: 1. it is not a painting, it is not even canvas, and 2. it is erasable even if this is not chalkboard paint. So what is this mystery art concoction? I am glad you asked. A few years back I wanted to fill a really large wall in our previous home and fabrics stretched on canvas were all the rage at the time. I found remnant fabric in one of the drapery stores that no longer exists (InVue Drapery for those who knew it). Well, in new house I could not use this "wall art" as it did not really match much and it was not the look I was going for this time around - so my first idea was to make something interesting using bleach to break up this fabric. First I tried using diluted bleach and tested a small sample of fabric - nothing happened. Then, I tried full on bleach and I left the fabric in it for a good day (even two days), NOTHING happened. That is some sturdy fabric. So I had no choice but to paint it. I've decided on our basement leftover paint - Benjamin Moore, Black Horizon. I am so in love with this paint - it looks so good and it takes on different shades depending on what is next to it or time of day it is. Love, love, love. 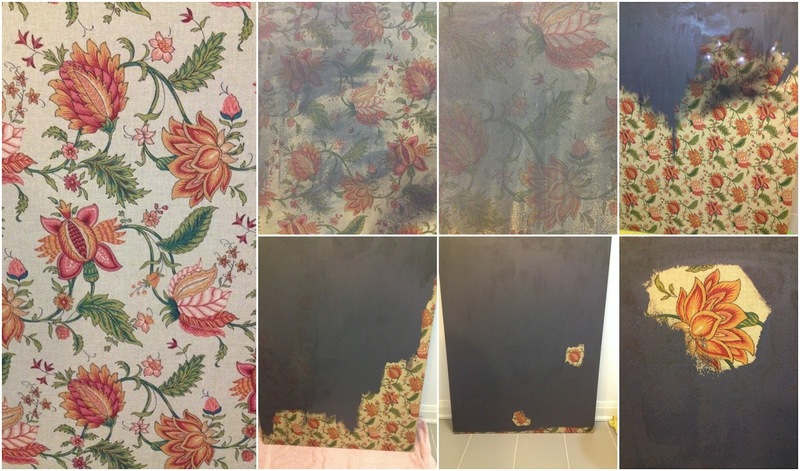 In the image above you can see the painting process and original fabric I started with. Those flowers were so beautiful that I experimented of just doing a whitewash (or really black wash) or leaving parts of it, but it did not look all that good. This paint is eggshell finish which works well for this new art decoration as you can see different strokes and sheen giving this "painting" some texture and interest. While I love it here, I absolutely hated it in basement where going with this finish was an absolute mistake. Anything other than full mat finish (not even Aurora flat) will show everything as you paint - we've learnedthis the hard way. Next step was adding something to the little black box. I jotted down several little sketches on a piece of paper until I found something I liked. Plan was to use cobalt blue oil paint to do it, but I used chalk first to trace the design. It's been years since I painted and I am definitely scared to just have a go at it. I did this chalk sketch in one swoop which is what I wanted really. I liked it a lot and I was not sure if I will be able to achieve "no hesitation" marks or "no interruption and continuation" points. So, I decided to leave it as is. Added bonus is that I can just wipe it off and do something else when I grow tired of it. Voila! This is the finished product. For those of you who are detail oriented you will notice a little nail on the left bottom side. I could pretend that it is something cool and say that it is my signature to add nails to my "paintings" but the sad truth is that either wall or frame is very crooked and it was not staying close to the wall. No double sided tape would hold it in place, so nail it was! 1. We painted the walls and window frames Benjamin Moore Cloud White. We are still in love with this colour. 2. We ripped the carpet from stairs and painted the stair threads Benjamin Moore Chelsea Grey - predictably we also love it two years later. Our front door is painted the same colour. 3. Fig tree and plant pot are from Ikea, felt basket from Target (clearance item find), and lantern is from Home Sense. The reason the threads look like in need of some repainting is that we've been using them like this for last 2.5 years. When I say using them, I mean abusing them. There are many nicks in them, transfer of red paint (my toddler flung her red chair down the stairs one day), but I am still ok with them as is and will do a bit of repainting only after a few more charming marks are left on them. You can see more of that in this next photo of stairs going upstairs to second floor. We painted the underside of staircase all white (as well as sides and railing). I love how this painting peeks through as we go upstairs. As a side note, yes, I know, I have staircase with open threads, no baby gates, and four children, one of them baby and one a toddler. This is probably a good subject for another post. I love how this art does not take away from the view (even though view is dreary at the moment) but if anything it frames it. I wanted lines of the painting that took your eye up and out plus keeping it monochromatic helps outside shine next to it.